Have you seen a modern surveyor using a single vertical rod with an instrument on top to measure property lines? That pole is nicknamed a "Jacob's Staff." Hundreds of years ago, however, the term "Jacob's Staff" was used to refer to more than one type of instrument; it's the other instrument that I want to discuss today. 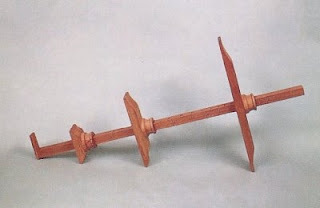 A recreation of a Jacob's Staff. The other instrument was also called a cross-staff, or a fore-staff, or (around the Mediterranean) a balestilha. 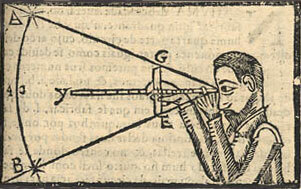 It comprised a staff with cross-pieces designed to allow the user to determine angles of distant points. By aligning it with, say, Polaris (the North Star), a sailor could determine the angle between the star and the horizon. Matched against known measurements, the sailor then knew his latitude. Knowledge of geometry and arithmetic also allowed the user to determine other measurements. If the height of a distant tower were known, that number and the angle known via the staff allowed you to determine your distance from the tower. Alternately, if you knew your distance from the base of a tall object, finding the angle from you to the top of it helped you determine how tall it was. The Jacob's Staff had another name as well when used with heavenly bodies: radius astronomicus. From an early book on navigation. Although some ascribe it to a contemporary of his, an astronomer named Jacob ben Machir (1236-1304). This might also explain its common name, since no other convincing etymology has come forth. The invention of the more precise sextant in the 18th century rendered the Jacob's Staff a quaint relic, and the name, when used, came to refer only to the simpler measuring stick we still see today. 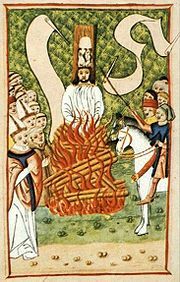 After Jan Hus was executed for heresy in 1415 (Jan Hus has been discussed here and here), his followers, called Hussites, continued to protest vehemently for the reform of the Church. A very popular Hussite priest of the church of the Virgin Mary of the Snows, Jan Zelivsky, led a procession to the Town Hall in Prague that gathered a large number of citizens. The protest was about the inequality between peasants and the nobility, and about the perceived corruption of the Church that had been successfully preached by Wycliffe. Preachers such as Zelivsky urged people to take up arms to combat their oppression. After the procession reached Charles Square in the city, someone threw a stone at Zelivsky from a window of the Town Hall. This act caused his followers to enter the building en masse, seize the judge, the burgomaster (the Mayor of Prague), and thirteen members of the town council, and throw them all out a window. Those that did not die in the fall were finished off by the crowd. This was called the Defenestration of Prague, from the Latin defenestrare, "to throw out a window. "* Over a century later, it would be re-named "The First Defenestration of Prague," because the act was so useful that it became a pastime. 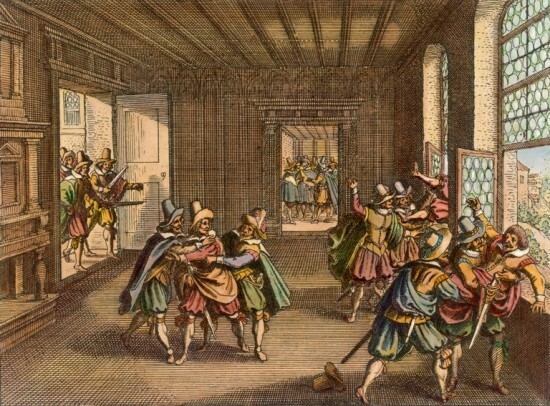 Later depiction of a Prague defenestration. The Catholic Encyclopedia would have you believe that this event so disturbed King Wenceslas IV that he died shortly after due to shock. Perhaps someone should update that page. Wenceslas died over two weeks later, after suffering a heart attack while hunting in the woods around his castle. He had been sympathetic to non-conformists and to the idea of reform, and had been a supporter of Jan Hus. The Defenestration surely would not have pleased him, but a king in his 50s who had seen what Wenceslas had been through was used to controversy. Sadly, his death along with the Prague violence helped kick off the Hussite Wars. The Defenestration of Prague took place 593 years ago today, in 1419. Consider how you might honor the event as you go through your day! *Let us pause and reflect on the utility of Latin, to already have a word for this act! It was needed at least for the Latin Bible, so that Jezebel could be defenestrated in 2 Kings 9:33. When Leofric, Earl of Mercia, died in 1057, his estate of Kingsbury passed to his widow, the Countess Godgifu, better known to later generations by the Latin version of her name, Godiva. The Domesday Book, compiled on King William's orders in 1086, lists her as a landowner as of the Conquest in 1066, but no longer. So where did her property go? Prior to William of Normandy's attack in 1066, Edward the Confessor had been inviting Normans over the Channel as councilors; several of them had already been given lands. After 1066, Normans were put into all positions of power, and Saxon nobles were demoted to lesser landholders. Two Saxons, however, had chosen to support William in 1066. One of these was Thorkill of Arden (also called Turchill). Thorkill's father, Æthelwine, was a nephew of Leofric and the Sheriff of Warwickshire in 1066. Perhaps Thorkill saw supporting William as a way to enhance his own standing. Perhaps he truly believed that William was the rightful ruler; reasons why he might were discussed here. Perhaps he just didn't like Harold. In any case, he was confirmed as Sheriff after his father's death. Thorkill held Kingsbury for several years; he is listed as the landowner in Domesday. King William's third son was crowned William II on 26 September, 1087 by Bishop Lanfranc. William II was in many ways a successful king, although not universally popular; perhaps confiscating people's lands had a role. William took Kingsbury away from Thorkill. That was not the end of the Arden family's prosperity, however: they remained prominent in Warwickshire politics. A descendant, Mary Arden, was the mother of Shakespeare. *That is, of the nobility; Bishop Wulfstan of Worcester was, technically, the most powerful Englishman in 1086. Remember Edward the Confessor? He may have had good qualities, but getting along with family was not one of them. Not only was he harsh to his mother, he quarreled frequently with his father-in-law, Godwin, who happened to be one of the most powerful men in England. One of the quarrels between the two was "mediated" by Leofric, Earl of Mercia (d.1057). King Cnut (c.985-1035) divided England into four provinces (East Anglia, Mercia, Northumbria, and Wesex) and gave each to an earl. The earldom of Mercia was given to Leofric after its original earl, Eadric Streona, died in 1017 (within months of Cnut's division). The position meant Leofric was second in power to Godwin of Wessex. When Cnut died, Leofric supported as his successor Harold Harefoot over Harthacnut. Harold was the son of Cnut's first wife, Ælfgifu, and Leofric may have been related to her. Harold became king, but when he died in 1040 and Harthacnut ascended the throne, Leofric must have felt a little awkward. Fortunately for Leofric, Harthacnut died in 1042, and his half-brother Edward the Confessor took the throne. When Edward and Godwin quarreled in 1051, Leofric brought an army, along with Earl Siward of Northumbria, and joined Edward's troops in facing Godwin's forces. Leofric counseled that they should settle the conflict peacefully rather than risk destroying the fighting power of England. The result was Godwin's (brief) exile. Life was good for Leofric, and his son Ælfgar replaced Godwin as Earl of Wessex; but Godwin and Edward were reconciled a year later, and Ælfgar had the humiliation of losing his earldom. In 1053, when Godwin died, Ælfgar got the position back again. 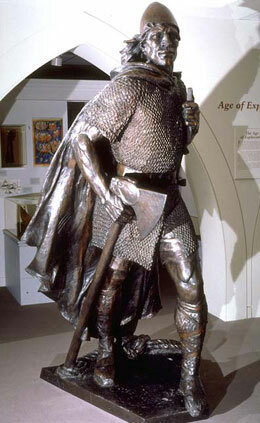 Ælfgar seemed to follow in the footsteps of his predecessor, not his father, and was exiled in 1055, whereupon he raised a fleet and tried to attack England. But that's a different story. Talk about a different story: I've left out one tidbit about Leofric—the one everyone knows, although they don't know they know it. Leofric and his wife, Godgifu (Anglo-Saxon for "god gift"), were very devout people. They endowed a Benedictine monastery in Coventry, and later records credit them with supporting monasteries at Chester, Evesham, Leominster and Much Wenlock. Some later writers claim she was the primary influence for her husband's generosity. In fact, there is a story (without evidence) that she was so opposed to the oppressive taxation imposed by her husband on his tenants, that she was willing to go through an 11th century version of "truth or dare." What we know of her husband suggests that not only would he not have been so cruel to his tenants, but neither would he force his pretty young wife to shame herself by riding naked through the streets of Coventry. Still, the story won't go away, although Godgifu probably wouldn't recognize either the telling or the Latinized version of her name, Godiva. In 1085, Duke William of Normandy had been ruling England as King William for twenty years (it all started here). He decided it was finally time to take inventory of his property. He sent his agents (3-4 commissioners for each of 7 areas the country was divided into) to make a survey of everything south of the border with Scotland. * They met with groups of representatives (barons and villagers) and asked a series of standard questions. By the end of summer in 1086, the reports (in Latin) were all being compiled back at Winchester, along with data on the value of the land and its assets immediately pre- and post-Conquest. The entire work is in the same very neat handwriting, so a single scribe was given the job of compiling/collating everything. 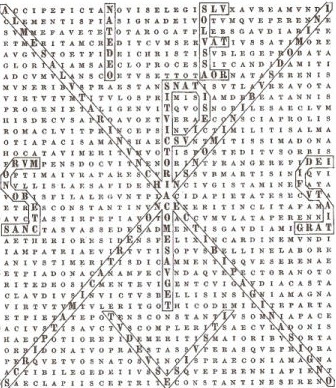 The official name of the result was "The Book of Winchester." So why is it usually called "Domesday Book" now? That nickname was given to it about 100 years later, and just like it looks, it means "Doomsday." The idea behind the nickname is that the book was such a complete listing of everything in England that it was equivalent to the "Book of Life" used by God at the end of time to judge your deeds. It was that complete. For one thing, work ceased by the time King William died in September 1087. The section on East Anglia hadn't been compiled into the total work. There is, therefore, a "Little Domesday Book" with the East Anglia data. Also, important cities such as London and Winchester were not included, probably because William figured he knew them well enough and didn't need an accurate accounting of their property assets, such as he would want for the countryside. Also, attempts to judge population using Domesday fall short of expectations. Although farms and buildings were counted, only heads of households were included in the population count. In castles, the number of men were counted, but the population in monasteries and convents was not. Best guesses, extrapolating from what data are included, is a population of 1.25-2 million, a far cry from the estimated 4 million during the Roman occupation. Still, the Book contains a lot of fascinating information in its 413 pages, which I will draw on in the future. *N.B. : The border with Scotland was much farther south than it is now. My research (or just day-to-day life) sometimes bring me details that I wish I'd known when I wrote a certain blog post, or that I think are interesting tidbits that tie into posts. 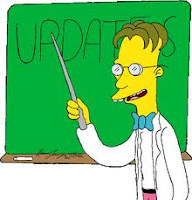 Occasionally, I will throw these updates together with links to the originals. Also, there was a building called "Domus Conversorum" in Oxford, and for awhile it was thought that Oxford (which had a large Jewish population pre-Expulsion) had its own Converts' Inn. It is accepted now, however, that the property was called thus because the rents from it went to supporting the Domus in London. John Wycliffe was a fascinating character for many reasons, but I may have been remiss in "finishing him off" by not giving you the whole story (one of this blog's followers commented on this on Facebook). Wycliffe died 31 December, 1384, after suffering a stroke a few days earlier while saying Mass. It wasn't until 4 May 1415 that the Council of Constance declared him a heretic (prior to this, only some of his writings were proscribed). His books were to be gathered and destroyed. The Church—never one to do things by halves when defending the faith was involved—exhumed his body in 1428, burned it, and scattered the ashes in the nearby River Swift near Lutterworth. Just this week it was reported that satellites have seen a sudden and massive melting of the ice on Greenland. The specific/immediate cause is unknown. This may make archaeological digs for Erik the Red's settlements easier to examine. The report is here. Geoffrey Chaucer (c.1342-1400) and William Shakespeare (1564-1616) are both credited with increasing English vocabulary. There is no proof that either of them actually invented the words we find in their works. All we can say for certain is that the words appeared for the first time in their works; it is likely that many of these words were in common use on the streets of London. While Shakespeare is usually the first to come to mind when the subject of contributions to the English language comes up, Chaucer actually gets credit for having more words we know now appear in his works first. Of course, since he had a two-century head start on Shakespeare, maybe it isn't a fair contest. preen, murmur, vomit, fart, strangle, commit, retain, oppress, create a mystery, or replenish material. Doctor, from the Ellesmere MS.
John of Gaddesden (c.1280-1361) was a "Doctor of Physik" who was quite well-known in his day, so much so that modern scholars looking to find analogs for the characters in Chaucer's Canterbury Tales have suggested he is the likeliest candidate for Chaucer's "doctor of physic." As a fan of both Chaucer and historical detail, I'm going to weigh in and say . . . maybe. Who was Gaddesden, and why was he considered the model for Chaucer's pilgrim? For one thing, he had written Rosa medicinæ (The rose of medicine; sometimes called the Rosa Anglicæ), a compendium of medical information called so because it was in five parts, like the five sepals of a rose. In it, he quotes numerous authorities from the past; Chaucer's list of authorities with whom his doctor is familiar lines up nicely with Gaddesden's sources. Also, Gaddesden had a reputation for charging high fees, and Chaucer makes it clear that his doctor loved gold. Last of all arose the scentless rose of England, in which, on its being sent to me, I hoped to find the odor of sweet originality, but instead of that I encountered only the fictions of Hispanus, of Gilbert, and of Theodoric. Those who write about Gaddesden being Chaucer's doctor usually justify it also be calling them "contemporaries." Let's look at the timeline: the Canterbury Tales probably wasn't started until 1387. 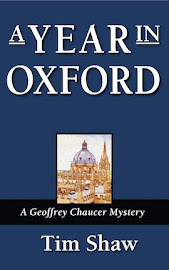 Even if the Prologue were the first thing he wrote—highly unlikely—this was a quarter century after Gaddesden's death; a death that would have taken place when Chaucer was about 20 years old and had been connected to the household of Prince Lionel, the second son of King Edward III, only for a few years. Gaddesden seems to have been attached to the household of Edward, the Black Prince, who would have spent much of Gaddesden's later years on the continent while Chaucer was in England. 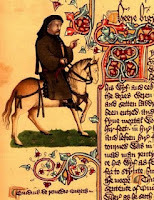 They could have crossed paths, but probably not significantly, and Gaddesden would have been long out of the public eye and consciousness when Chaucer came into his own as a poet. For Chaucer to write up a physician who quoted historical authorities, knew astrology, and loved gold probably just meant that he had met typical physicians. The history of medicine includes many brave and progressive thinkers who were not willing to follow the herd or be content with what was already known. One such in the Middle Ages was Guy de Chauliac. Born about 1300, he studied at a university in Montpellier known for its expertise in medicine. After becoming a Master of Medicine and Surgery around 1325, he went to Bologna for further study. His reputation became such that he was invited to Avignon to be personal physician to Pope Clement VI, then Pope Innocent VI and Pope Urban V. The papal connection gave him access to a library that included the texts of the Greek physician Galen in their original; most of Europe knew Galen through less accurate Latin translations. He possibly saved Clement's life during the spread of the Black Death, when he advised the pope to stay near blazing fires. Although many physicians fled Avignon at the arrival of the Plague, Chauliac stayed to study the disease and treat people. He determined that it was contagious, but couldn't figure out the method of contagion. 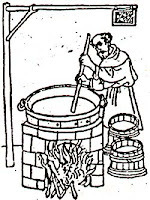 Still, he advised bloodletting, a healthy diet, and exposure to pure air (hence the fires, which would have serendipitously served to keep fleas away). He also realized that there were two diseases involved because of different sets of symptoms: the initial Bubonic Plague, and the follow-up Pneumonic Plague which found its foothold in the weakened population and killed much more swiftly. Chauliac spoke out strongly against those who blamed the Jews for the Plague, explaining that scientifically it made no sense to consider them at fault. Tools for withdrawing an arrow. His value to the rest of the world and history was the writing of Chirurgia magna (Great [book of] Surgery) in 1363. Its seven volumes covered every imaginable medical topic of the day: intubation, surgery, disease, anesthesia, hernia, cataracts, ulcers, bloodletting, cauterization of wounds, and the use of special instruments (some of which he designed himself, such as an elaborate contraption for withdrawing an arrow from flesh). Chauliac drew on the past, quoting Galen (129-c.200) and Avicenna (Abu Ali al-Husayn ibn Abd Allah ibn Sina, c.980-1037). He placed great emphasis on learning anatomy, saying that "A surgeon who does not know his anatomy is like a blind man carving a log." Chauliac was not always accurate. He believed, for instance, that pus was an important part of the healing process and should be left alone. Nevertheless, his Chirurgia became a standard text for the next three centuries, translated into several European languages. Unfortunately for future generations, anti-Islam sentiment caused many translators to leave out knowledge from Islamic scholars, resulting in a less complete and less accurate work. Still, he has been labeled the "Father of Modern Surgery," and his great work was the standard text until the 17th century. Far from being a complete intellectual vacuum in the years between the decline of Rome and the Renaissance, Europe experienced three distinct periods when the slow slog of culture enjoyed a short sprint forward. Two of them were connected specifically with royal patronage and the attempt on the part of a ruler to create something academically impressive and politically lasting. Scholars dispute the accuracy of calling them "renaissances" because their impact was not as lasting as the shifts in the 14th century that sparked an uninterrupted (so far) progression in all human endeavors. Erwin Panofsky, a 20th century German art historian, produced a slim tome in 1944 called Renaissance and Renascences in which he used the latter term to distinguish those other periods in history. Let's do that. The first Renascence took place during the reigns of Charlemagne (c.742-814) and his son, Louis the Pious (778-840). 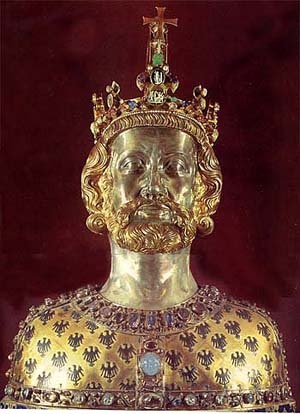 Charlemagne was not only King of the Franks. He managed to unite much of western and central Europe, and once he conquered Italy, he was in a position to be named Holy Roman Emperor. Empires require a great deal of bureaucracy, however, and the dearth of literate men to serve as court scribes and secretaries was problematic. Literacy was also a problem because many parish priests could not read the Bible. In fact, the lack of widespread formal training in Latin meant that its common use—what now is referred to as vulgar Latin—was developing into regional dialects. Some of these dialects would evolve into what we call the Romance languages. These men and others helped to create a "bright spot" in a time so often called "dark." There were still dark times to come in western Europe, but thanks to the Carolingian Renascence, Western Civilization survived—in the words of Sir Kenneth Clark in his epic Civilization: "by the skin of its teeth." Some medieval records indicate weather (drought years, particularly bad storms, et cetera), but they didn't have the organizational longevity (or the interest) to record long-term climate trends. Besides tree rings and ice cores, is there any "anecdotal" evidence from the Middle Ages itself that suggests long-term changes in average temperature? Let us look at Erik Thorvaldsson (950-c.1003), aka Erik the Red. Erik's father wasn't the most easygoing guy, and was exiled from Norway, whereupon he took his family to Iceland. Around 982, Erik himself got into trouble for killing some people (poor anger management was apparently a family issue). He sailed from Iceland to Greenland, where legend says he created the first settlement. It is likely that there was already a Norse presence, but Erik can probably claim credit for the first permanent habitation. If we can believe the sagas and records, then even though life was very harsh, in the 1120s there were sustainable settlements on the eastern shore that held 2000-4000 people. One modern scholar reports "190 small farms, 12 parish churches, a cathedral, an Augustinian monastery, and a Benedictine nunnery." On the western shore were "90 farms and four churches." Why the Norse settlements ultimately failed is a target for speculation–one theory is that rising amounts of sea ice made navigation, and therefore trade that was necessary to keep their society going, difficult–but here's the thing: excavations of those early settlements have found quite a bit of evidence of their way of life—but they have to dig under "permanently" frozen ground to do so. It is clear that those settlements existed—could only exist—at a time that was significantly warmer than Greenland's climate is today. Machiavelli's Il Principe (c.1513) was far from innovative. Writers since classical times had produced works that explained the proper behavior—or improper behavior—of rulers. The genre was called specula principum, or "mirrors for princes." These took the form of instruction books, often aimed at a young ruler who was just coming into power, or could be biographies of rulers who should (or should not) be emulated. The reign of Charlemagne seems to have motivated the desire to "raise the bar" for rulers and inspired many writers to produce mirrors for their local rulers in the 9th century. Charlemagne's life was, of course, the example to be followed as far as Einhard's Vita Karolini (Life of Charles) was concerned. No one wanted to see the Carolingian empire suffer after Charlemagne's demise, and so his descendants had no lack of advice. His son Louis the Pious was the target of one speculum by Smaragdus of Saint-Mihiel; Louis' son Pepin I of Aquitaine was the target of one by Jonas of Orléans; Louis' grandson Lothair II of Lotharingia was addressed by Sedulius Scottus in a work called "On Christian Rulers." Alcuin of York, a prolific writer and famous teacher, wrote De virtutibus et vitiis (On virtues and vices, c.799) for Count Wido of Brittany. 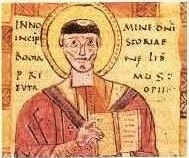 A friend of Alcuin's, whom he met at Charlemagne's school in Aachen, was Paulinus of Aquileia who wrote the Liber exhortationis (Book of exhortations, 795), for Count Heiric (Eric) of Friuli. Paulinus (c.730-802) had been born in the Friuli region of northeast Italy and he and Heiric were friends, so he felt entitled to tell Heiric a thing or two, including advising him to free his slaves. (Having slaves was common.) Paulinus also wrote an elegy when Heiric was killed in 799. Mirrors for princes were popular right through the Renaissance by scholars who felt qualified to give advice to powerful men. We know of ones that were written for the future Henry VIII (by John Skelton; a copy exists in the British Museum), for King Charles V of Spain (1516, by Erasmus), for King Christian IV of Denmark-Norway (1597, by Johann Damgaard), and King James I of England wrote one for his eldest son, Henry, who died of typhoid at 18; maybe Charles I read it when he ascended the throne. The simplest form of acrostic is a poem or other writing in which the first letter of each line spells out a word (presumably on that is related thematically to the writing). They are frequently used in education today because they are fun, but 2000 years ago they were considered valuable learning tools because of their embedded layers of meaning, especially the type of acrostic called carmina figurata ("shape poem"); it could either be a poem with words constrained to a shape such as a chalice or dragon, or it was designed so that various letters could be highlighted to make shapes or focus the reader on certain words or names. This practice had been elevated to a high art by Roman poets. The sample on this page is from Publilius Optatianus Porphyrius, who was writing to please the Emperor Constantine in order that Optatianus might be recalled from exile. 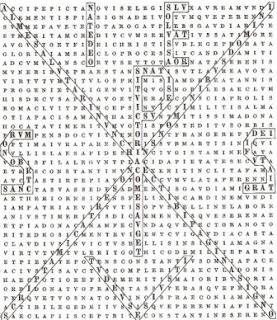 Optatianus is credited with inventing this type of carmina figurata, where the shapes to be found are internal to the poem, which is written out as a block (or other symmetrical shape) of text to aid in finding the lines. You can see not only the chi-ro symbol, but the name "iesus" spelled around the outside of the square. An interesting scholarly examination of Optatianus' figure poems can be found here. But away from the 4th and back to the 8th century: as part of Alcuin's academic push, he gave various assignments to the men working with him at Charlemagne's palace school at Aachen. One of the men working with him was Joseph Scottus. We know almost nothing about Scottus outside of his connection with Alcuin. He was Irish, and probably studied at the monastery in Clommacnoise. It is assumed that at one point he studied under Alcuin at York, and that connection drew him to the Frankish court when Alcuin took over. Despite his background and anti-Irish sentiment at the time, he was on very friendly terms with Charlemagne, and Scottus took over for Alcuin in 790 when Alcuin had business back home. Anti-Irish sentiment has a long heritage. In the Middle Ages, Ireland was a target of Western Europe disdain for at least two reasons. 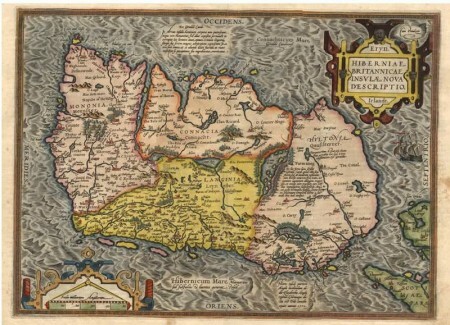 16th century map of Ireland. This could have been an accurate account of what he saw, but could just as easily have been intended to provide justification for Henry's conquest of Ireland in order to gain for himself and his sons more lands and resources. Pope Adrian IV (the first Englishman to sit the Throne of Peter) had written a papal bull in 1155 called Laudabiliter;* it gave Henry permission to assume control over Ireland and apply Gregorian reforms. ...and that was the second reason for anti-Irish sentiment: Ireland needed to be brought into line doctrinally with the Roman Catholic Church. Catholic missions to Ireland (notably that of the Scotsman, St. Patrick) had introduced Christianity centuries before this. Christianity had survived in Ireland while it suffered in Britain due to invasion from Northern European pagan groups. But the Christianity restored in Britain afterward was closely tied to Rome, while Christianity in Ireland had developed its own practices and rituals. Old habits are hard to break; "No Irish Need Apply" was not uncommon even in the second half of the 20th century, and Irish stereotypes and persecutions today are no new thing. *The names of papal bulls don't always signify their topic; in this case, it is named for the opening word, which says (in English) "Laudably and profitably doth your Majesty consider how..." N.B. : scholars have argued for the last few centuries over the authenticity and authority of Laudabiliter, but for the present purpose, we can accept that it was very real for the 12th century. So if the phrase "Dark Ages" was coined by Petrarch to describe the loss/lapse of much classical learning and advancement since the Decline of Rome (5th century CE), why do we say "Middle Ages," and what were they in the "middle" of? Petrarch's term didn't become a widespread label; the centuries immediately following him didn't study history dogmatically the way a modern liberal studies education demands. It was a German classical scholar named Christoph Cellarius (1638-1707) who standardized the three general periods of the past two millenia with his mammoth work Universal History Divided into an Ancient, Medieval, and New Period. "Medieval" was from the Latin medium aevum (literally, "middle age"). This triple division struck the right note and entered the realm of conventional wisdom. The Dark Ages is a term applied in its widest sense to that period of intellectual depression in the history of Europe from the establishment of the barbarian supremacy in the fifth century to the revival of learning about the beginning of the fifteenth, thus nearly corresponding in extent with the Middle Ages. The Encyclopaedia Britannica, 11th edition (1911) defined the Dark Ages as the period from the fifth to the tenth centuries, affirming that "the Dark Age was a reality." the contrast, once so fashionable, between the ages of darkness and the ages of light has no more truth in it than have the idealistic fancies which underlie attempts at mediaeval revivalism. A scholarly view of the "Dark Ages" has largely been eliminated in favor of the generic term "medieval" to distinguish between the Classical and Modern eras (Cellarius would be proud). In fact, because artistic, cultural, political and technological (et alia) development is a continuum, the division of "eras" has been muddled with a recent trend to refer to the Renaissance as the "Early Modern Era" (I remember a lecture from my grad school days in which we joked that maybe the Middle Ages would soon be labeled the "Really Early Modern Era." Part of this desire to eliminate the concept of "dark" Ages is also 20th century understanding that not only was the period not a complete intellectual wasteland, but also that there were at least three "re-births" of education and art prior to what we think of as the European Renaissance. This is the opening of a 1999 film on Joan of Arc. Joan's dates were 1412-1431, a far cry from anyone's idea of the Dark Ages. * What were the Dark Ages, exactly? The term is commonly used to refer to a time when education lapsed and "not much happened." Well, the amount that was happening could fill a daily blog for quite awhile. Each famous author of antiquity whom I recover places a new offense and another cause of dishonor to the charge of earlier generations, who, not satisfied with their own disgraceful barrenness, permitted the fruit of other minds, and the writings that their ancestors had produced by toil and application, to perish through insufferable neglect. Although they had nothing of their own to hand down to those who were to come after, they robbed posterity of its ancestral heritage. Essentially, for Petrarch, the Dark Ages was that period between the glory that was Rome and the glory that was his own era. 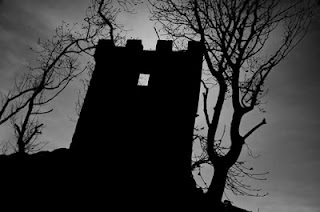 Nowadays, if the term "Dark Ages" is used at all, it is used for the first half of the Middle Ages, denoting the period right after the fall of Rome to about 1100. So where/when did we start talking about the "Middle" Ages? *And don't get me started on "Merlin" having a prophecy about Joan. 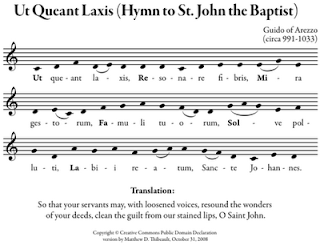 clean the guilt from our stained lips, O Saint John! What does this have to do with Julie Andrews? Nothing, until the 11th century, when Guido of Arezzo (c.992-1050) proposed an ascending diatonic scale for music. * He realized that the hymn was a perfect mnemonic for the scale, and so he described the scale using the syllables on which the ascending tones fell: ut, re, mi, fa, sol, la. 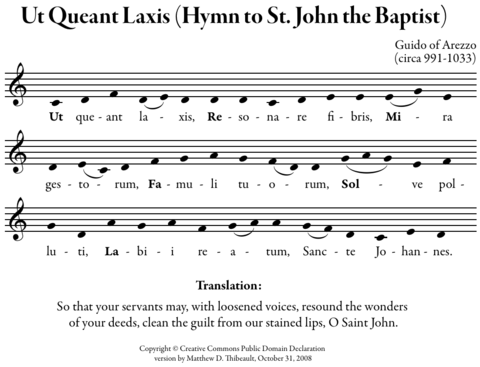 Around 1600, in Italy, a musicologist named Giovanni Battista Doni refined the scale by changing "ut" to "do" because he preferred the open vowel sound it created, and added a seventh note which he called "si" because of the SI initials from "Sancte Iohannes." So we had do re mi fa sol la si. It was a long time later that a Norwich, England music teacher named Sarah Glover (1785-1867) developed a method she called Sol-fa for teaching a capella singing, and changed si to ti so that each syllable would start with a different consonant sound. Glover published her ideas, and they were further refined (and sometimes independently developed) by people like John Curwen, Pierre Galin, Aimé Paris, Emile Chevé. I cannot draw a direct line from any of these to Rodgers and Hammerstein, but by the time R&H came along, "singing the scales" was a commonplace way of teaching the rudiments of music to children. When R&H needed a number for a scene in the 1959 musical "The Sound of Music" when Maria teaches the children to sing—after discovering they knew nothing of singing because their father had forbidden it—what was more natural than using the sung scales that had been developed over the past thousand years? Hammerstein turned each note to a homonym to flesh out the lyrics, and the rest is theatrical/cinematic history. Hammerstein should be grateful that he didn't have to write a lyric for "ut." *"Ascending" is important here: previously, the scale was described as a series of descending notes. Educated in the cathedral school of York, Alcuin became a monk and teacher. On his way back to England from a trip to Rome in 781 he met Charlemagne, King of the Franks, who recognized Alcuin's erudition and invited him to stay and help promote learning to a level unknown since Rome. Alcuin became head of the palace school at Aachen, where he established a great library, revised the liturgy, wrote treatises and poetry and works on grammar. It is his influence on learning that is said to have vaulted Latin into the position of being the academic language. 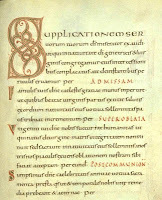 Propositiones ad Acuendos Juvenes is attributed to Alcuin, because of its date and because it is the kind of work he would have created for the pupils at Aachen. The 50+ puzzles in it are very mathematical, with three river-crossing problems—although in his early example the items are a wolf, a goat, and a cabbage. Solutions are provided for all the problems. There can be no solution to this puzzle, for obvious reasons. (Feel free to post the reason why in the comments to explain it to your fellow readers.) The assumption is that it was given to difficult students to frustrate them. *Alcuin also recorded the destruction of Lindisfarne. Rabelais (c.1494-1553) was a little late for this blog, but his statement in Chapter XIX of Gargantua indicates a reliance on time-keeping that the modern world can understand. It was not always thus, however, for the Middle Ages. I discussed yesterday how early concepts of time by their nature might have made it difficult to think of time as something measurable. I mentioned a mid-1200s definition of time that came from Franco of Cologne, the mathematically-minded music theorist who created what is the basis for modern musical notation. Franco's most diligent biographer places him as chapelmaster at Notre Dame in Paris. Johannes de Sacrobosco (c.1195-c.1256) taught at the University of Paris, probably contemporaneously with Franco. Johannes was an astronomer who, among other things, declared that there was a flaw in the Julian calendar: it was 10 days off. (That error wouldn't be corrected until long after.) He also wrote of an attempt he knew to construct a wheel that would make a complete rotation in one day. Robertus Anglicus wrote a commentary in 1270 on Sacrobosco's treatise, mentioning the device and further spreading the idea. In that same decade, a clock is described by someone writing in Spain that runs by the flow of mercury from chamber to chamber in a wheel. It only took a generation for this idea to catch on. By 1300, clocks were becoming widely known (if not widely owned), but the early ones only measured hours—they rang bells, but had no faces with markings around a dial, no minutes or seconds were counted, that we know of. 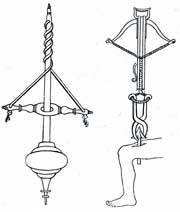 The device described by Sacrobosco and Anglicus used a weight hanging from a line around a wheel or cylinder. The Middle Ages understood wheels, gears, levers and pulleys, but how could these be used to guarantee a steady revolution of the weighted wheel? Sometime around 1300, or not long after, some early mechanical "Eureka" moment took place. Someone designed what we call the "escapement," which rocked back and forth on a toothed gear, allowing the wheel to turn at a steady, measurable, predictable speed. It also had a side-effect: a steady sound that we have been listening to ever since. Humans could now mark time in sequences of ticks and tocks. Minutes and seconds could be distinguished. Hours could be regulated. Six hours before noon became the same, whether it were dark in winter or already light in summer. (That's right: the 12 hours from sunrise until sunset used to be extended or shortened depending upon the season.) This was a change from the canonical hours described by the Rule of St. Benedict, for whom prayers at Matins were supposed to end as the sun rose, and therefore had to be started at different times depending on the season. In 1370, Charles V of France installed a clock in his palace, and decreed that all clocks in Paris be set according to his. Punctuality, crucial feature of our modern world, was born. What then is time? If no one asks me, I know: if I wish to explain it to one that asketh, I know not: yet I say boldly that I know, that if nothing passed away, time past were not; and if nothing were coming, a time to come were not; and if nothing were, time present were not. Those two times then, past and to come, how are they, seeing the past now is not, and that to come is not yet? But the present, should it always be present, and never pass into time past, verily it should not be time, but eternity. With this passage, found halfway through Book XI of his Confessions, St. Augustine of Hippo (13 November 354-28 August 430) discussed the difference between Time and Eternity. He knows that he is not aware of time that is yet to come, or time that is past; only time that is present; but he still doesn't know how to define what time is. Measurement of time was imprecise. There were "hours" of the day: the Vigil took place between 2:30 and 3:00 a.m., Matins came at Dawn, et cetera. These hours designated times of worship and work for monks and were extended to general use, but they were not exactly a way to quantify time. The hour of Sext was at noon, for instance, which was recognized when the sun was highest, but Matins/Dawn came more or fewer hours before Sext, depending on the time of year. They were segments of the day that altered with the seasons; they did not measure a span of time. If anyone shall come to matins after the Gloria of the 94th Psalm, which on this account we wish to be said slowly and leisurely, he shall not take his place in the choir, but go last of all, or to some place apart which the abbot may appoint for those who so fail in his sight. Time could be measured, therefore, by comparison to a known duration. * But even durations could be tricky. Augustine had pondered thinking of a long syllable as equivalent to two short ones, "But when two syllables sound one after the other—the first short, the second long—how shall I keep hold of the short one?" Augustine seemed to be caught up in the idea that time was a continuum, and that he was living in a constant present and could not treat the past and future in the same conceptual way, since he could not live in them. The Middle Ages couldn't grab time and measure it, like water or distance or even acceleration. It was insubstantial, and belonged to God. The concept of time had to change ... and eventually it did. There was no clear turning point; there had to be some conceptual change, planned or otherwise, to see time not as a line but as a series of points, as separate moments that could be thought of without being linked to a past or future moment. Sometime in the mid-13th century, we find Franco of Cologne. He was a music theorist who gave us the idea that a mark on a page should distinguish how long a note should be. This was the logical extension of Franco's definition of time: "Time is the measure of actual sound as well as of the opposite, its omission." Was this the moment? Was it music, with its attention to and reverence for mathematics that accidentally inspired the thinking of time as separate units that could be measured and counted? We might be able to believe that, if there were some evidence that the world began to measure and quantify time; for instance, if the development of mechanical clocks were to start around this time. Well, guess what happened next? *This method of measuring spans of time without a clock is used even today. Jan Hus (c.1369-6 July 1415) was enamored of the ideas of John Wycliffe, creating controversy for Bohemia when the church hierarchy decided that Wycliffe's ideas were heretical. King Wenceslaus IV—perhaps alarmed that Prague was becoming the center of church controversy—tried to reconcile the opposition with a synod in 1412. The synod was a failure: arguments persisted, and Hus and his followers refused to accept the absolute authority of the pope. Ultimately, the Council of Constance (1 November 1414) was assembled to deal with the ongoing papal schism and other issues. It was called by Wenceslaus' brother, Sigismund of Hungary. The debates began. After several weeks the rumor was spread that Hus intended to flee; in December he was imprisoned by the church. Sigismund was angry because he had promised Hus he would be safe, but the church officials convinced Sigismund that a promise to a heretic wasn't binding. Hus was passed around, finally spending two and a half months in chains. His trials for heresy took place in June 1415, during which (as was customary) he was not allowed to have any defense. He offered to recant if he could be proven to be in error. Of the several points on which they demanded he recant, he asked that they not expect him to recant things he had never espoused; also, as a matter of conscience, he refused to recant points they said—but could not convince him—were errors. On 6 July, 1415, Hus was led into the cathedral where, after a High Mass and a sermon on the need to eradicate heresy, he was condemned publicly and led outside, where he was clothed in his priestly vestments so that they could strip them from him. Still refusing to recant, he was burned at the stake and his ashes were thrown into the river. Jan Hus (1369-6 July, 1415) was a pious child whose manners and performance while singing and serving in church in Prague distinguished him. He earned his baccalaureate at 24 and his master's at 27 from the University of Prague. He was ordained in 1400, and became rector of the university in 1402. Hus shared these observations, and like Wycliffe began to preach against what he saw as the corruption and moral failings of the church hierarchy. In 1406, when some Bohemian students brought to Prague a eulogy for Wycliffe bearing the seal of Oxford University, Hus read it proudly from the pulpit. By this time, it was known that King Wenceslaus IV was tolerant of non-conformists. Pope Gregory XII, getting wind of all this, sent a stern warning about Wycliffe's heretical works and the king's attitude. The king and the University of Prague both stepped backed from the preaching of Wycliffe and Hus. Statue of Hus in Prague. In December 1409, Pope Alexander V issued a papal bull against Wycliffism. Hus appealed to Alexander in 1410, but in vain. All available works of Wycliffe were rounded up and burned, Hus and his followers were excommunicated. Bohemia sided with Hus against the Pope. (This was easier to do since Alexander was the third man currently considering himself a pope; but that's another story.) Like Wycliffe being supported by his friends and powerful political allies, Hus survived a few attacks by the church. Eventually, however, his luck and support would run out. *I blame all that Oxford education. Mashing up grain, letting it sit in water with yeast, then letting it ferment was easy to do and produced a drink that provided calories, hydration, and not a debilitating amount of alcohol. Spices were sometimes added for variety. At a time when water was not always potable or easy to come by, turning it into a tastier drink was a desirable goal, easily accomplished by many households. And brewing would have been an ongoing process: hops provide preservative qualities that ale would lack. Given, however, that ale was drunk on a daily basis by almost everyone, frequent brewing would have been planned, and the more the better, because selling excess was a great way to make some extra cash. Because ale (and later beer) was such an essential commodity, regulations for controlling prices, amount, and quality abound. Records of fees levied reveal the large number of women involved in the process. 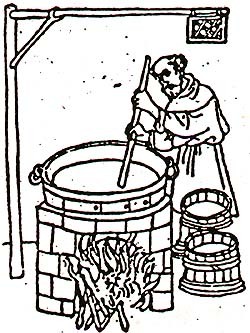 In fact, it is fair to say that brewing was a woman-dominated career in the Middle Ages at least until the Black Death, and for most of the rest of that century. Every village and hamlet probably had women who provided most of the ale to those who did not brew their own. The introduction of hops changed the industry as well as the drink. Hopped beer could last longer, and it was therefore efficient to brew it in mass quantities. The equipment needed for this required a larger outlay of capital, which the cottage-industry alewife could not afford. Also, brewing in large quantities was more labor intensive and could not easily be squeezed into the day by the woman who had other domestic chores to attend to. The brewing of hopped beer became a town-centered industry dominated by men; where women were involved in the new model, it was as distributors. If this post has whetted your appetite for historical ale and beer knowledge, consider this or this. *Search the Internet for when hops started being used and you will find a wide variety of answers. Trivia: The Middle Ages Brewing Company (in Syracuse, NY) website says "Come and see ... British style 'real ale' brewery." Do you suppose they really leave out the hops? Sir Robert Bruce Cotton was born 22 January, 1570 (or 1571). Too late to be part of the Middle Ages, but still a subject for this blog; you'll see why presently. He attended the Westminster School on the grounds of Westminster Abbey in London, considered one of the finest schools in England. From there he went to Jesus College, Cambridge, graduating with a BA in 1585. In 1601 he was made a Member of Parliament and started a successful political career. He helped King James I develop a new fund-raising scheme with the invention of the title/position "baronet." A baronet (like a knighthood) did not confer on the bearer a right to attend Parliament (and therefore be a potential nuisance), but it was a lovely and impressive title that could be inherited; many wealthy men would willingly pay large sums to be made a baronet, which gave them a hereditary title for their childfren but no real power. Robert Cotton, painted in 1626. Despite Cotton's friendship and value to the king, he began to become a concern when his views about the importance of parliament over the monarch were expressed in his published essay The Dangers wherein the Kingdom now standeth, and the Remedye. The monarchy considered this a threat, and they decided to take action to prevent Cotton from becoming the center of discontent. The monarchy had a simple solution to pull the rug out from under Cotton: confiscate his library. The assumption was that his library held documents that might provide historical precedents for his political views. Why was his library such a concern? Robert Cotton had a hobby: for decades he had been collecting documents, manuscripts, books, records. He had an insatiable desire to collect and preserve the history of the written word in England, and he created a library with more documents (it was said at the time) than the Records Office in London. It was confiscated by the king in 1630. Cotton died in 1631. The library was eventually returned to his family; his grandson gave it to the British Library. The Cotton Library was, of course, pre-Dewey Decimal and pre-Library of Congress. He had his own scheme for organizing documents. His library was lined with bookcases, each of which was topped by the bust of a classical figure. Each bookcase had up to 6 shelves, designated by letters. Each shelf was filled with documents, counted from left to right. Items in the library were designated by bust/shelf/#document. For instance, the Anglo-Saxon Chronicle (one of nine surviving manuscripts) is designated Cotton Domitian A.viii. Many works of literature from the Middle Ages, such as Beowulf (Cotton Vitellius A.xv) or Sir Gawaine and the Green Knight (Cotton Nero A.x) exist today only because they were collected and preserved thanks to Robert Cotton's hobby. In 635 CE, St. Aidan (c.?-651) was sent from the monastery on the island of Iona by King Oswald to re-Christianize England. He chose to found a monastery on an island off the northeast coast of England. Although it is mentioned in the 9th century Historia Brittonum (History of Britons) by the Welsh name of Medcaut (Healing), perhaps because of a reputation for medicinal herbs, it is more commonly known as Lindisfarne. Lindisfarne is a tidal island, meaning it is accessible by a causeway only when the tide is out. St. Aidan thought that this would provide security for the peaceful community of monks. Aidan was given a horse by Oswald, so that he could ride to the nearby communities to preach. Legend says he gave the horse to a beggar and walked from village to village, speaking quietly and simply to the inhabitants, spreading the message of Christianity that had once been brought to England by Romans, but had been replaced after the fall of Rome by Anglo-Saxon paganism. The night St. Aidan died, a teenager had a vision that inspired him to become a monk. He was made prior of Lindisfarne in 665 and bishop in 684. When he died in 687, St. Cuthbert (c.634-687) was made the patron saint of northern England. 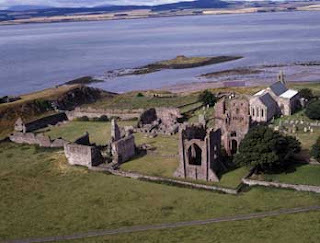 More raids in 875 led to the abandonment of the island by the monks, who carried away as much as they could, including the remnants of St. Cuthbert. Now it has a population of fewer than 200. It is largely a nature reserve and a destination for tourists who visit the ruins of the priory and a small Tudor fort turned into a castle. A leechbook was a collection of remedies, called so because a physician or surgeon was called a "leech." Bald's Leechbook is a very early (9th century) example. For hare lip, pound mastic very small, add the white of an egg, and mingle as thou dost vermilion, cut with a knife the false edges of the lip, sew fast with silk, then smear without and within with the salve, ere the silk rot. If it draw together, arrange it with the hand; anoint again soon. We don't know if this is just theory, or if it were actually put into practice with the desired results. "Bald owns this book which he ordered Cild to compile." Cild may have been someone with medical experience as well as being the organizer of the book, or he may have simply been a copyist who brought together various sources for Bald. Two doctors are mentioned in the book, Dun and Oxa, but we don't know much else about them. The leechbook is organized into two volumes, dealing respectively with external (such as skin, teeth, or ear) and internal (such as upset stomach, jaundice, or vomiting blood) problems. The surgery is in part one. This organization is different from many other leechbooks and collections of knowledge, which often gather together every bit of lore known to the author without much regard for categorization. Another collection is a late 10th/early 11th century manuscript named Lacnunga (Anglo-Saxon for "Remedies") by its 19th century editor. It uses Anglo-Saxon and Latin to list medical knowledge, remedies (some the same as in Bald's), prayers, charms and incantations, and some Old Irish poetical prayers for health. Both are found in the British Library. A 19th century searchable edition of Bald's can be found here. "In ye bigynyng iwas ye word", Wycliffe Bible. We are pretty sure that Wycliffe didn't do the whole book himself. Nor was he the first: the Bible had been translated into Old English centuries before Wycliffe, but manuscripts were rare and piecemeal. 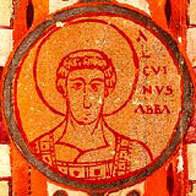 The Venerable Bede (c.673-735) and Aldhelm (c.639-709) had each translated parts of the Bible into Old English. 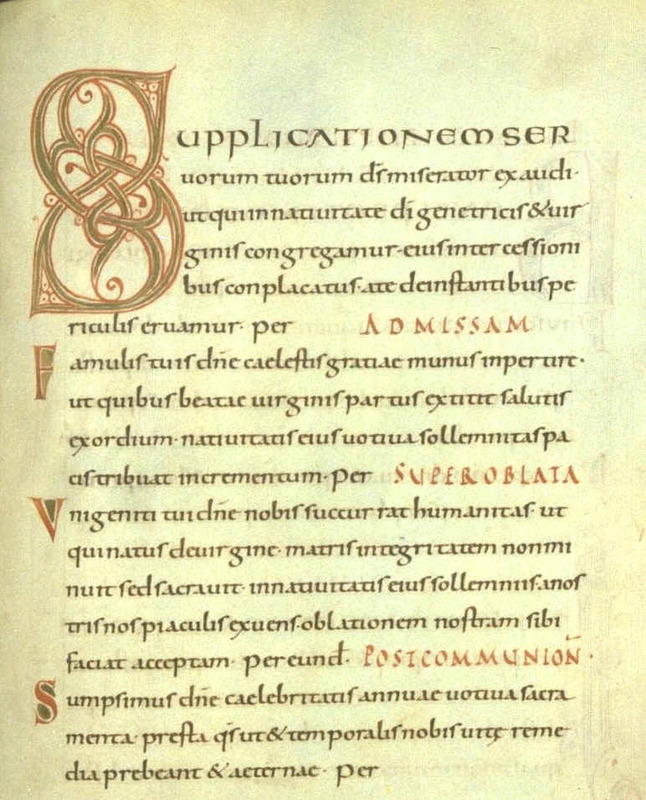 The oldest existing manuscript we have is the Lindisfarne Gospels, a 10th century Latin text of Matthew, Mark, Luke and John with Old English translation inserted between the Latin. Many so-called Middle English Bibles were in fact paraphrases or commentary rather than strict translations. So he set about making a careful translation with his friend, Nicholas of Hereford. Although using familiar English words, they stuck to Latin syntax, and so a sentence that we know as "And God said, Let there be light, and there was light." which is a fairly sensible translation of the Latin, came out (following Latin word order) as "And God said, Be made light, and made is light." In the years after Wycliffe's death in 1384, a follower of his (probably John Purvey) revised it, changing the word order to "And God said, Light be made, and light was made." The Bible was popular—over 250 copies exist—but the church objected to it and to Wycliffe's increasing influence on the common people, especially after the Peasants' Revolt and the increasingly vocal and active Lollard movement. The early 1400s saw some extremely strict censorship laws put into place to prevent any more unauthorized translations. The problem was that, since the Wycliffe Bible had been translated from the Latin (whether carefully or not) without editorializing, it was not easily distinguishable from "authorized" translations. This may be why so many copies survived. Of course, 1453 and Gutenberg were just a couple generations away, which meant that the production of "unauthorized" texts was about to become frighteningly easy. *N.B. : "sentence" in the Middle Ages did not mean just a collection of words expressing a complete thought. From the Latin sententia, it signified concepts such as "meaning" or "thought" or "opinion." Everyone knows that to discuss the history of fireworks means talking about China and Marco Polo (1254-1324), but the real history of fireworks in the European Middle Ages may start with Roger Bacon (1214-1294). Bacon was a Franciscan Friar who spent time at Oxford and may have studied under Robert Grossteste. He has been called the first user of the scientific method, but more careful study of his works suggests that his conclusions and theories were the result of "thought experiments" like many other scholars, instead of actual scientific experimentation. Although Oxford's fairly careful and complete records of degrees given do not show that Bacon ever earned a doctorate, he was nicknamed Doctor Mirabilis (wonderful doctor) for his ideas. We have an example of these things (that act on the senses) in that children's toy which is made in many [diverse] parts of the world; i.e. a device no bigger than one's thumb. From the violence of that salt called saltpetre [together with sulphur and willow charcoal, combined into a powder] so horrible a sound is made by the bursting of a thing so small, no more than a bit of parchment [containing it], that we find [the ear assaulted by a noise] exceeding the roar of strong thunder, and a flash brighter than the most brilliant lightning. Then wonders can be done by explosive substances. There is one used for amusement in various parts of the world made of powder of saltpeter and sulphur and charcoal of hazelwood. For when a roll of parchment about the size of a finger is filled with this powder, it produces a startling noise and flash. If a large instrument were used, the noise and flash would be unbearable; if the instrument were made from solid material, the violence would be much greater. These are the earliest references in the English-speaking world to gunpowder and fireworks. Whether Bacon ever made his own gunpowder is unknown, however. Some articles will tell you that he could, and encrypted the knowledge in order to prevent its misuse. 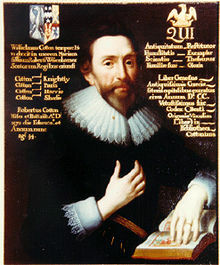 Claims that Bacon hid the formula for gunpowder in his works cannot be substantiated, however. He seems to know what goes into the formula, but not necessarily in what proportion. The secret numbers that some modern manuscript detectives claim to have found in his writings produce the wrong ratio for gunpowder to do more than smoke. John Wycliffe (c.1324-1384), first discussed yesterday, started his career as a respectable Oxford scholar and theologian. His religion and study taught him that wealth was not needed for a Christian life, and not appropriate for the clergy. This was not a radical idea, or new—Francis of Assissi had been preaching and embodying the ascetic life almost 200 years earlier*—however, his arguments and his public presence and patronage made him notorious. It was after the conference at Bruges (mentioned briefly in the above link) that he seems to have decided he needed to make a more overt defense of his views. Wycliffe might have been fine keeping his views in the rather private academic arena, but when he was denounced and challenged in public by William Bynham of Wallingford Priory in Oxford, Wycliffe decided to go public with his Summa Theologiae in which he explained why the church should not have temporal authority, and that the king was above the pope in earthly matters. He followed this with De civili dominio (On civil lordship), in which he stated that if the church should abuse any of its temporal holdings, the king should take those holdings away; not to do so would be remiss. It was the strongest argument (and the most welcome, to members of the nobility) for the king's authority over the church. The monastic orders, who benefited from the feudal system of rents and tenants, were understandably threatened by this, especially considering the patronage Wycliffe enjoyed from men like John of Gaunt, who was effectively the ruler of England during Edward III's decline. When Wycliffe was summoned before Bishop William Courtenay of London, he was accompanied by John of Gaunt, the Earl Marshal Henry Percy, other nobles, and even some friars of the orders that rejected personal possessions. Gaunt's presence cowed the bishop, and the gathering broke up without immediate consequence for Wycliffe. This pattern, of attempts to chastise or reign in Wycliffe being overwhelmed by his supporters, would be repeated more than once in the years to come. In fact, Wycliffe's views were so popular in England that they sparked the anti-establishment movement called "Lollardy" about which it was supposedly said at the time "Every second man that you meet is a Lollard." It is certain that the citizens involved in the Peasants' Revolt were familiar with his views on equality, although he disapproved of their violence. It is ironic that Wycliffe's most powerful patron, Gaunt, was also one of the chief targets of the mob because of his aristocratic standing. It was not long after the Revolt that Wycliffe was officially being denounced as a heretic, which complicated his life but didn't stop him from writing. As well as other tracts and letters, he had one more major work he wished to produce that would shake the church to its foundations. He decided to do what had never been done before: translate the entire Bible into English. *Umberto Eco's The Name of the Rose is remembered as a murder mystery set in 1327 by many readers who have forgotten that one of the central themes is the philosophical debate on the topic of the church and material wealth. A church reformer gets his start. We don't know a lot about the early years of John Wycliffe (c.1324-1384). There were likely a few "John Wycliffe"s around this time, and there are doubts that the one who went to Merton College in Oxford in 1346 was the same one who was master of Balliol (a far more liberal-minded college) in 1360, who was given a position in the parish of Fillingham. His time at Oxford might have overlapped that of William of Ockham; it is certain that the Wycliffe in whom we are interested was familiar with and influenced by Ockham's writings. His running of Fillingham (and a succession of parishes) did not prevent him from living at Oxford and participating in the college as an instructor and a scholar. He became known and respected as a theologian, and received his doctorate in theology in 1372. Wycliffe's entrance to politics is presumed to be in 1365, when he advised John of Gaunt (the king's son, but a powerful political figure in the wake of King Edward III's increasing senility) to deny Pope Urban V the 33 years of feudal tribute for which England was in arrears. The tribute had been established by King John, but Wycliffe told Gaunt that the papacy was wealthy enough and did not need or deserve the money. Gaunt and Parliament were all to willing to agree: Edward III had the habit of outspending his income, money was always needed in case a war with France should arise again, and this was the time that the papacy itself was in Avignon, France. Giving money to the pope in France felt like giving money to the enemy against whom you might need to fight a war some day! By this time, Wycliffe had developed strong opinions opposing the wealth of the church. He was not branded a heretic (yet!). Had he been openly thought of this way, he would hardly have been included in the delegation that attended the peace congress in Bruges in 1374. Bruges had two purposes: establishing reduced hostilities between England and France, and dealing with the papacy's problems in the English church. He seems to have attended purely as a respected theologian whose opinions were academic, not militant. At the time he was still friends with men like the monk John Owtred, who held that St. Peter proved the union of spiritual and temporal power—an idea totally opposite to Wycliffe's thoughts on the subject. That would change in the next decade. By the time of Wycliffe's death ten years later, he would lose his friends, his positions, and the respect of the papacy and many of his colleagues. He would also start a reform movement, produce a controversial Bible, and influence a reform movement in Bohemia. More tomorrow. In this year the Moon was eclipsed on mid-winter's Mass-night, and the same year King Ecgbert subdued the kingdom of the Mercians and all that was South of the Humber. "The moon suffers an eclipse if the shadow of the earth comes between it and the sun" while an eclipse of the sun takes place "when the new moon is in line with the sun and obstructs and obscures it." While Medieval Europe had Isidore to explain what was happening, however, they did not necessarily have the knowledge of the Babylonians and Greeks to understand why it was happening. The event could still be unnerving. Bishop Eligius of Noyon in the 7th century warned: "When the moon is darkened, no one should dare to utter shouts, because it becomes dark at specific times at God's command." Hrabanus Maurus (c.780-c.856), another encylopedist, tells of a lunar eclipse when some threw spears toward the moon, trying to defend it from its attacker. Even if the mechanism of eclipses was understood, people might still accept them as a sign of great portent, or as the result of human actions. Bishop Thietmar of Merseburg, referring to an eclipse of 990, wrote "I urge all Christians that they should truly believe that this does not happen on account of some incantations by wicked women, nor by eating, and it cannot be helped by any action in the world." Oh, and when Astronomy Today tells you that the eclipse of May 5, 840 so frightened King Louis that he "died just afterwards"? Ask to see their sources. Louis died on June 20th at the age of 62, after years of quelling civil wars. I think there are likelier reasons or his death than being afraid of an eclipse.